Here is an alternative stuffing which can be served with your turkey or prepared in advance and frozen to serve with other roast meats. It’s delicious with ham. Thaw at room temperature before rolling in oil and baking. In a frying pan, cook the onion in 1tbsp of the oil until soft. Leave to cool. Place the meat, sage, nuts, apricots, salt, pepper, egg, breadcrumbs and 1tbsp oil in a large bowl and add the onion mixture. Using your hands, mix and shape into golf-sized balls. 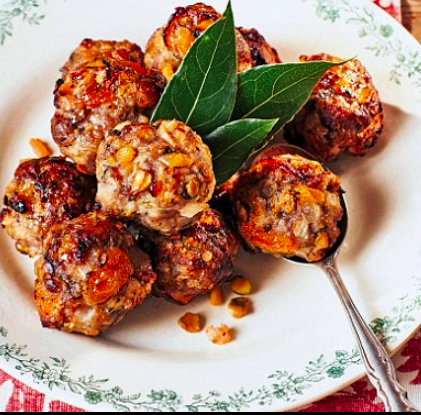 Place the remaining oil in a roasting tin and roll the stuffing balls in the oil to coat. place the balls on the shelf above and cook for just 20 minutes). Serve with the bay leaves, if using.